If you can fish 2 feet away from your best friend and catch fewer than half as many fish – be it winter or summer, trout or spiny ray – you need to begin searching for the reason why. A good place to start is acknowledging that scent matters. If you are in the habit of gassing up your vehicle on the way to a fishing destination, think about donning the plastic gloves supplied at most diesel pumps. The road into the Porcupine Bay campground is being worked on and is predicted to be passable early in May. The boat launch will probably not be ready until the end of May. The Burke Lake Trout Derby scheduled for Saturday is finally a go. All other lakes in the area that opened March 1 will be fishable by then. White sturgeon retention closed on the Columbia River from John Day Dam to McNary Dam today. Catch-and-release fishing will continue. Charlie Craven, the fly tying editor for Fly Fisherman magazine, will hold a fly tying clinic for the Spokane Fly Fishers on April 10 from 2-4 p.m. at 6116 N. Market in Spokane. The cost for nonmembers is $20. Craven has been named one the 50 most influential people in fly fishing. Attendees are encouraged to bring their equipment and to tie along with Craven with material provided by the club. Register online at the Spokane Fly Fishers website before Sunday or call 991-5140. The St. Joe River has been providing good fishing for anglers using indicator rigs and dry/dropper rigs, Silver Bow Fly Shop said. Streamer fishing has also been good in slow water. The lower North Fork Coeur d’Alene River has been decent, with indicator fishing the best tactic. The east portion of Sprague Lake was ice-free when I drove past on Saturday. There were boats on the water, although the WDFW access near the island was still locked up with ice. Sprague Lake Resort was open for business. Liberty Lake has open water. A few big browns have been caught by anglers fishing from shore. Two friends and I fished from shore at Fort Spokane on Lake Roosevelt last Sunday, taking home eight 16- to 17-inch rainbow and losing several others. We fished probably one-quarter mile downriver from the bridge. The bites came in bunches with a lot of dead time between. Anglers fishing near Sterling on Lake Roosevelt reported three nice rainbow and two 16-inch kokanee last weekend. Trollers fishing near the net pens on Rufus Woods this week said limits (two trout) were common with most of the fish running 3-7 pounds. Although Amber Lake it is still under selective gear rules, the season runs through Nov. 30 with a daily limit of one trout over 18 inches. Amber was excellent for ice fishermen this winter, and the bite should continue strong. Medical Lake has shed its ice and anglers are catching a few nice rainbow and brown trout. This lake is also under selective gear rules, with a daily limit of two trout of at least 14 inches. The use of bait is prohibited. Downs Lake receives hatchery catchable-size rainbow trout this month and should also begin fishing well for largemouth bass, perch and crappie. Coffeepot Lake in Lincoln County is producing rainbow trout and perch, mostly on flies. Coffeepot is under selective gear rules, with a minimum size limit of 18 inches for trout and a daily catch limit of one. If you prefer a smaller and secluded setting for your fishing activity, Z Lake on the Swanson Lakes Wildlife Area in Lincoln County will provide a productive day of quiet trout fishing for those willing to walk the mile in. Pacific Lake in Lincoln County has retained good water levels the last couple of years. It was stocked last spring and fall with rainbow trout, which should provide anglers some good action this year. Billy Clapp Lake in Grant County is giving up limits of fat 16- to 17-inch rainbow. The lake also has kokanee, but the bite for that species is several weeks off. Kokanee of 11-14 inches are biting at Hayden Lake in Idaho. Troll standard kokanee gear 45-65 deep. Access to the lake is available on the west end, from the Honeysuckle boat ramp, and from the northeast end at the Sportsman’s Park boat ramp. This year, Idaho Fish and Game is stocking 1.8 million catchable rainbow trout between 10-12 inches, strictly for anglers to catch. They are typically stocked where they are easily accessible to anglers and there is a high probability they will get caught. In the Panhandle, Cocolalla Lake will be stocked Monday through April 12 with 6,600 catchable trout. Fernan will be stocked the same dates with 5,510 catchables, and Lower twin will receive 1,420. Chinook salmon fishing has been good this week on Lake Coeur d’Alene. The fish are in the top 15 feet of water and are hitting Rapalas as well as helmeted herring. A lot of the fish are under the 20-inch minimum, but even the sublegals are a lot of fun to catch. Anglers fishing the Ringold Springs Access area must release all steelhead, except hatchery steelhead marked with both a clipped adipose fin and right ventral fin. This rule also removes a requirement to use barbless hooks while fishing for steelhead there. Through April 15, the steelhead fishery is open only to anglers fishing from the bank on the hatchery side of the river. The spring chinook bank fishery is open through May 5 above Bonneville Dam. Walleye anglers are taking a lot of small fish on the big flat just upstream from Porcupine Bay. Closer to Fort Spokane, the fishing has also been good and the fish have been larger. Try bouncing a white jig sweetened with nightcrawler at around 50 feet or dragging a bottom bouncer and worm harness. Near Gifford, the walleyes have been deeper. Walleye fishing on the Columbia and Snake rivers has been heating up, Reel Time Fishing in Clarkston said. This is the prespawn fishery where the largest fish of the year are caught. The Snake produces more big fish, while the Columbia produces quantity. Fishing has been fair for walleye on Rufus Woods Reservoir and Banks Lake. Moses Lake and Potholes Reservoir will heat up soon. In the meantime, the largemouth bass bite is on at Moses. April is the best month to target prespawn northern pike from shore in the bays on Lake Coeur d’Alene with smelt or herring under a bobber or on bottom. Several 8- to 10-pound fish have been taken. Jeff Smith at Fins and Feathers in Coeur d’Alene said there has been an unconfirmed report of a 28-pounder caught. Bluegill, crappie and perch are being taken in the back end of Lake Fernan. The crappie bite has been unusually good for this time of year. The application period for Idaho moose, bighorn sheep and mountain goat controlled hunts began on Monday and runs through April 30. 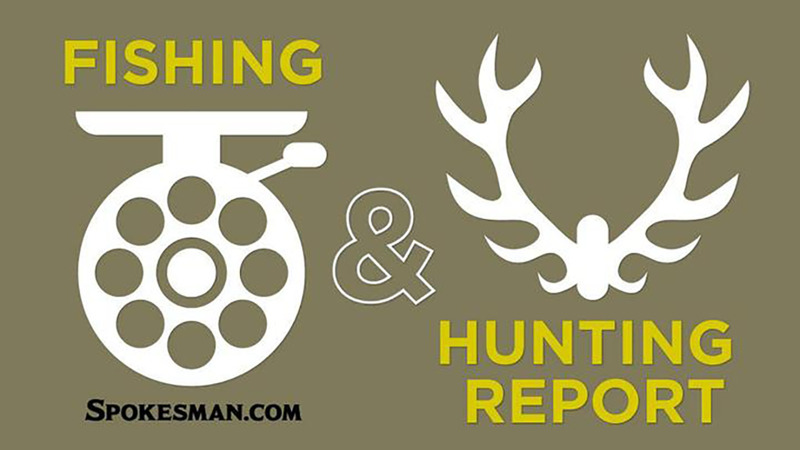 Hunters can apply online or at any Fish and Game office, license vendor, or by telephone at (800) 554-8685. Hunters are reminded that Fish and Game no longer accepts mail-in applications. The Washington youth turkey hunt is Saturday and Sunday. Published: April 3, 2019, 4 p.m. Updated: April 3, 2019, 4:08 p.m.